Suggestions that were added to the game. In a nutshell: The tarrain is flat and that is boring. There should be some kind of terrain elevation. - "real" elevation with shading on the sloping tiles. Requires extensive engine support. - fake elevation with no change to the grid, only some cosmetics to make it look good. 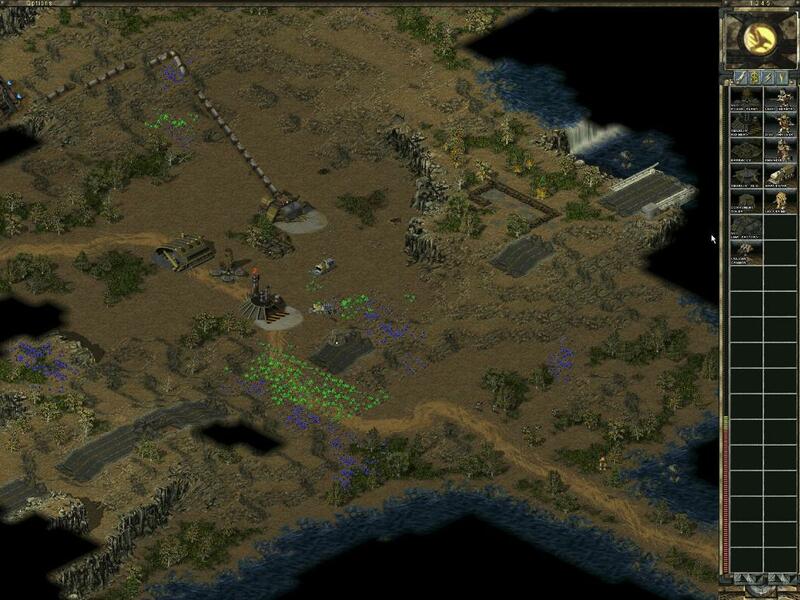 Let me explain what I mean with two (large) screenshots of the old Command & Conquer games. With the gritty look and the ore on the ground, definately comparable to Factorio. First the "real" elevation. The cliff is 4 units high, sloping tiles make a difference of one unit. The tiles are aligned differently, but that's insignificant. The sloping tiles are lighter or darker shaded, depending on their direction. But the ground itself can also be lighter or darker, making it hard to identify the sloping in some places. The fake elevation in the first C&C game only uses the cliffs. They are cosmetic building blocks which only look as if there is a height difference. Also the cliffs don't need to be closed like contour lines, they can start and end deliberately. Their only real property is, that they are impassable. They may give a combat advantage, but that's secondary and I'm not sure if it was even done in C&C. With "real" elevation, only belts, pipes, rails and paving may be built on slopes (big amount of new sprites), which may need to be really gentle to not look totally unrealistic for the rails especially. For everything else you would need flat land, which means you need some way to terraform it. That may sound nice at first but probably quickly becomes more cumbersome work than gameplay worth. The fake elevation is the way to go with Factorio. Not only to go easy on the devs, but because it is actually the better choice in my opinion. - The cliffs consist of building blocks. - They are around 3 tiles wide (may be wider or thinner at places). - Nothing can be build on a cliff. - Electric wires may connect over a cliff. - I'm undecided on underground belts and pipes. I tend to no. Opinions? - No vehicle can drive accross a cliff, maybe down, but that is probably fatal. - The character can traverse a cliff (special climbing animation but not too fancy) with slow speed. - The aliens can or cannot traverse a cliff, I'm not decided. Opinions? - The cliff may be blown apart with a huge amount of explosives to make way. - There may be building blocks, where two cliffs join into one. - ..., where several cliffs culminate to a big mountain top. Cliffs provide an obstacle, something that now only the water does. They make the environment richer, challenging and force the player to adapt to it more. Since the player can traverse cliffs, but other means of transportation can't, near ressources may actually be badly reachable. In such environments a niche technology, such as the wished for ropeway conveyor https://forums.factorio.com/forum/vie ... f=6&t=7977, can play to it's strengths. This makes the research tree much more interesting, when you can research specialized stuff that helps you in your situation. It adds replayability to the game, when you are forced to adept even your long term strategies to the environment. - The character can climb now. It should be able to climb pipes as well. - Stone may be mined from suitable cliffs instead from the ground. - Cliffs may loose a boulder now and then, especially when beeing shot at, which then rolls down the hill (read: away from the cliff) wreaking havock on it's way. Last edited by tobsimon on Sun Dec 27, 2015 4:41 pm, edited 1 time in total. I would also prefer fake elevation. Underground belts and pipes through cliffs could break the elevation illusion. Also, I think this new difficulty would be interesting. "could break the elevation illusion"
Good point you make there. Could be saved by introducing hacky special cases, where the opposite end is shifted, but thats not very elegant. No traversing the cliff for underground belts then. Underground pipes however? It's done frequently in real life. suggestion 1: halve the distance an underground pipe can go when crossing, to make up for the supposed height difference, and the vertical pipe length. suggestion 2: require a pump to send fluid in the "up" direction. 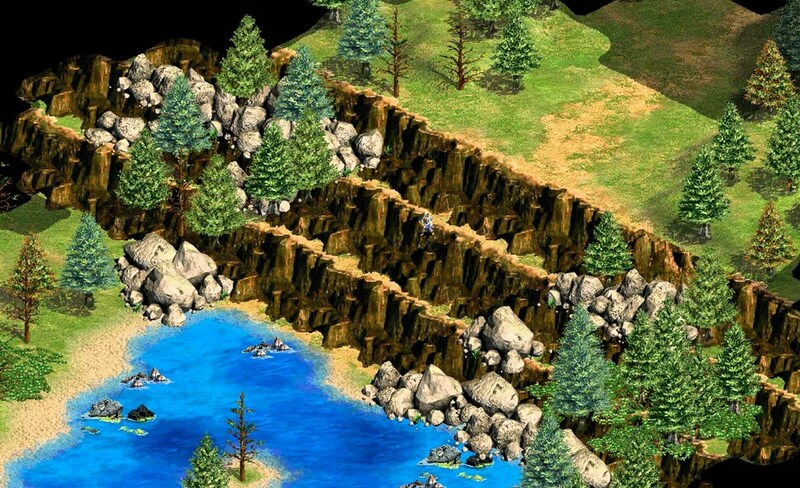 I think having false cliffs or 'false isometric cliffs' as i think i've called them in the past would be such a great addition to the game, and i really hope the devs jump on board. I like fsjd's ideas for the underground pipes. Halving the distance also provides a good explanation, why underground belts aren't fit for cliffs. tobsimon wrote: I like fsjd's ideas for the underground pipes. Halving the distance also provides a good explanation, why underground belts aren't fit for cliffs. Why not just have it cost one underground belt to go through a cliff? Lower end would appear to stick out of the cliff at the lower ground level, while the higher end would appear as a regular underground belt end, on the square next to the cliff. That could quiet effectively help not to break the elevation illusion. From a gameplay perspective, cliffs are meant as obstacles which are not easily overcome. A factory should not be able to simply spread over the cliff, but be bounded by it to some degree. You need to accept detours with rail and other vehicles and special structures, like the ropeway conveyor (which hopefully makes it to the game, too) to bridge it. Taking that property away by allowing underground belts to go through, defies the purpose of the cliffs. Then they are barely more than a gimmick and nuisance, instead of a gameplay element (like rocks now, simply shoot 'em to shreads and be done with it). If there is no alternative other than the detour (which may not be possible), this restriction probably hits to hard. Thus the exception for pipes. So, the argument against underground belt crossing is in large part based on the assumption that there will be a ropeway conveyor. Game actually has a X and Y coordinate system, but if something like elevation could be added, it would also need a Z coord. So, what does i mean by that? Simple, while in Z=4 you see the normal pipe going to the ground, anywhere where Z=3 would be the normal pipe graphic, it would be very handy. But Goldern, what if the pipe is going underground in Z=4 and it's max range makes Z=1 the final spot? Then it's also simple to fix, Z=4(the first spot) would be the graphic of the pipe going underground, Z=3 would be the pipe normally flowing, like it's already in the game (over the ground), limit between Z=3 and Z=2 (you can do crazy coding here to not put underground pipes in the slope, direction oriented like x-1 or x+1 or y-1 or y+1) would be a pipe going underground, then Z=2 would be the pipe, limit between Z=2 and Z=1 would be the pipe going underground and Z=1 would be normal piping as already ingame. If the underground pipe is going uphill(yeah, everything can happen), the code should detect that Z increase and make the first placed underground pipe a commom pipe (as already in game, again) and do all the things i said but backward, or they could make a uphill pipe instead of crazy behavior with underground pipes. -Spitters could attack at different Z levels, spitting. I'm a bit sceptical for landscape. If you try to build something like a modelrailroad with terrain elevation, this requires a lot of planning. If you look at some layout plans on the web you realize that the possibilities to build interesting layouts on a smaller scale with landscape which are more sophisticated are surprisingly low. In generell you can probably have more fun with randomly generated flat landscapes which give you more freedom to build railway networks. My first impression when I saw a few screenshots of factorio was, that the game is quite dark and gritty. Maybe this is intended and in generell I like the graphics, but I would prefer lighter terrain graphics. If I compare factorio to other topdown games, which have a day-/night circle like grandtheft auto 2 or GTA chinatown wars, they are never this dark mainly due to lighter ground-/terrain textures. I think the easiest addition that could be done very fast is to place randomly generated mountains which would simply be bigger versions of the destructible rocks that already spawn currently. The mountains should be unpassable and nothing else, it's just an aesthetic addition which could give some more spirit to the landscapes of factorio. The fake-impossible-to-pass-through cliffs are the second best option for gameplay for now, visually and programmatically. The cliffs, should always be open at some point and in this case, the player would have to use the open slope in order to allow rails, pipes and belts to pass the obstacle. Give the cliffs a three tile visual area, and a five tile hitbox. Just was we have with some of the rocks in game now that are four tiles wide but appear two tiles wide. 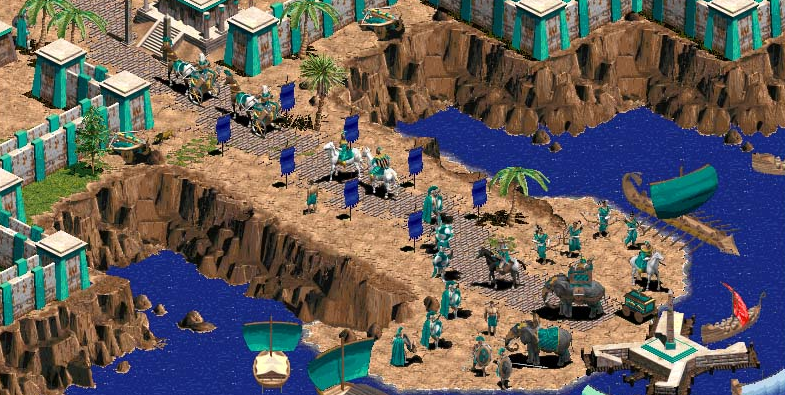 You see these are all from age of empires, but i like the look of them, and the way they worked in the map editor. I was thinking about two types of mountain terrain (similar to water and deep water), a low mountain that is still impassable but can be leveled using explosives and high mountains you can bore tunnels through with explosives. The mountain (really a continuous grouping of high mountain terrain) would show up like normal but if you mouse over it or walk inside a tunnel you'll see the tunnel instead. Could also make it so you have to built scaffolding to prevent random cave-ins and as a mechanic to prevent people from clearing out the entire mountain which would ruin the illusion. (slightly off topic): The fake cliffs could be useful for reference to water nearby which could include adding a moving water terrain type that could be the source for building dams. I'm puzzled and sceptical about the tunnels. Would they be like an underground layer? Can stuff pass through them? Are the mountains you think of different from the proposed fake cliffs, other than general dimensions and the requirement for the cliffs to make one side appear higher up than the other. What general dimensions were you thinking of? While the normal cliffs should be destructable with explosives, there may very well be another type, the big cliffs, which are not. The normal cliffs in my opinion should be around 3 tiles wide and appear to be substantially higher than the character, but not more than 3 times his/hers height. The cliffs form ridges roughly 40 tiles long (and not straight). These ridges are definitely not closed, they may however appear to form a terrasse, but also canyons or any other structure, including splits, merges and culminations of several ridges. BTW: I'm all for moving water. And waterfalls. And boats. Im really split on this suggestion. Yes it needs something to give the maps more variation, but tbh if it were an option most people would just turn cliffs off, as it would just frustrate, rather than anything else. It wont add much to the game apart from stopping you build a tidy mega base. you could still build one, but your main bus line would have to be split up just making everything bigger and messy. Addiction Thy Name be Factorio, FACTORIO IS NOT A LIE. Killavirus wrote: but tbh if it were an option most people would just turn cliffs off, as it would just frustrate, rather than anything else. Citation needed. How do you know most people would do that? By seeing the issue brought up a couple dozen times and the ratio of responses. seronis wrote: By seeing the issue brought up a couple dozen times and the ratio of responses. The people who talk about things on the forums are not necessarily a perfect representation of the player base. We're the loud assholes who like to complain. 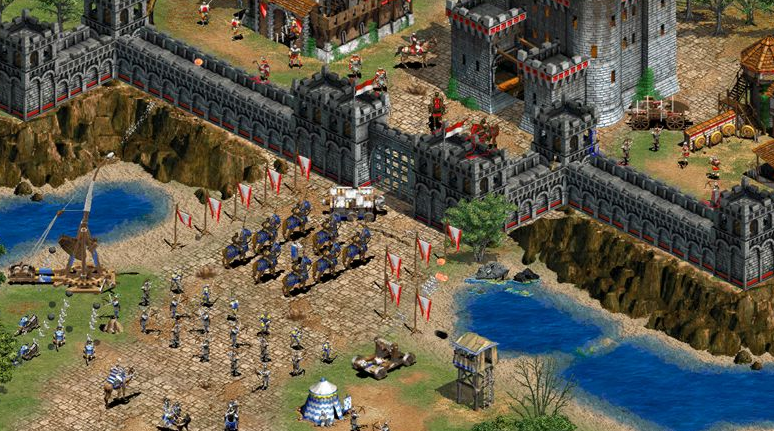 For pure 2D graphics, I liked how games like TTD and Sim City 2000 did it with slopes on a 2D tile grid, or the CnC games that had both slopes and cliffs. Sim City 2000 made the rail tracks use 2 tiles for slopes, with a little structure thing to avoid the overly steep track issue. What about using a real height map? e.g. as seen in Railroad Tycoon 2, Sim City 3000 and many more similar games and RTS's (although most really recent ones use full 3D for units and buildings). Buildings would just auto level or have foundations to an extent, while belts/tracks would auto level and have a steepness limit. The belts/tracks/terrain sprites are not created for every possible angle, but rather use simple 3D rendering to allow the tiles to be deformed as needed.